It goes without saying that the chances of winning a Wave permit are extremely low. According to data obtained from the Bureau of Land Management, 161,467 people applied for wave permits in 2017. Out of those 161,467 people, only 7,300 people received permits or about 4.5% of applicants. An individual can apply a total of 401 times per year. So, what can you do to give yourself the best chance of winning when you apply? There are two ways to apply for permits; the online lottery and the walk-in lottery. The online lottery is available each month, with winning applicants drawn on the first of the following month. The walk-in lottery is available every day during the Summer months and Monday-Friday in the Winter months. In Winter, you can apply for Saturday, Sunday, and Monday on Friday morning. If you can’t apply every month, apply for the least popular months. Apply on the last day of the month. Apply for the least popular days. Apply for days that have lower average group sizes. When you apply online, you are selecting up to three dates, four months in advance. For example, when you apply in January, the drawing will be for dates in May. The best time to apply online is the last day of each month because the lottery website shows you how many applications have been submitted for each day, so you will be able to see exactly which days give you the best chance of winning a permit. The image above is a screenshot from the application website. You can see that November 27th has 112 applications whereas November 3rd has over twice as many. If you can keep a flexible schedule, applying on the 27th gives you a much greater chance of winning than on the 3rd. Another statistic to consider is the average group size for each day. The lower the group size, the better your chance of winning. Look at November 29 and 30. They both have the same number of applicants, but a different number of people. November 30 is lower on the list, so at a glance it would appear to be the better day to apply, but if you calculate the average group size, you can see that the average group size is smaller on November 29 (3.16 vs 2.94). The difference is small but worth considering, especially if you are with a larger group. The reason this is important is because unlike the walk-in lottery, a winning group that has a larger number of people than permits available is thrown out altogether. At the walk-in lottery, the group can still accept the remaining permits. Smaller group sizes mean a greater chance of more applications being drawn. April saw 6,852 applications representing a total of 21,421 people compared to January’s 1,964 applications representing only 6,064 people, so make sure you are applying for these less popular months. The weather may not be the ideal temperature, but that is a small price to pay for the chance to see the Wave. Plan your visit during the least popular months. Apply on the least popular days of the week. Accept the permits even if there are fewer permits than the number of people in your group. Bring someone in good shape along. Many of these suggestions are very similar to those for the online lottery. Applying every day of your trip is the most important tip. It may cost money to apply online, but the walk-in lottery is free to enter; you only pay for the permits if you win. You may get a late start visiting other attractions, but it will be worth it if you win. Plan your trip in January, February, or December. It may be cold during these months, but the National Parks are still open and are very beautiful when they are covered in snow, which is a sight most tourists will never see. The skies are also clearer in the winter months, making the stars more visible. 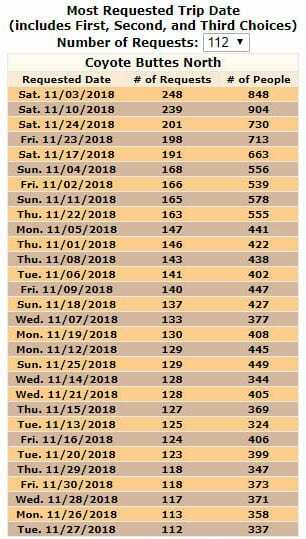 If you can only apply on a few days of your trip, try and apply on the least popular days of the week. 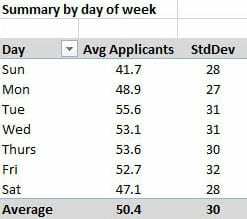 This can be hard to predict, but below is a chart showing the average applications for each day of the week. Keep in mind that this chart is from 2013, but it is the most recent information I could find on this statistic. According to this data, the least popular days to apply are Sunday, Saturday, and Monday. Just remember that this data is somewhat dated, and it also considers all months of the year for both walk-in and online applications, not just walk-in applications for the winter months. The last two suggestions go hand in hand. Accept the permit even if there are not enough to cover the people in your group. The folks who stay behind will find other amazing things to see and do. Many groups turn down permits because not everyone will be able to go. For most people, visiting the wave is something they will only have the opportunity to do once, so do it even if your friends can’t. This is where bringing along someone who is in great shape can benefit you. The only name on the permit card is the person who applies for the permit. Have your fit friend win the permit, that way if you only win enough permits for part of your group to go, you can hike half of your group in during the morning and the other half can hike in during the evening. Whoever wins will just have the pleasure of making the hike twice. 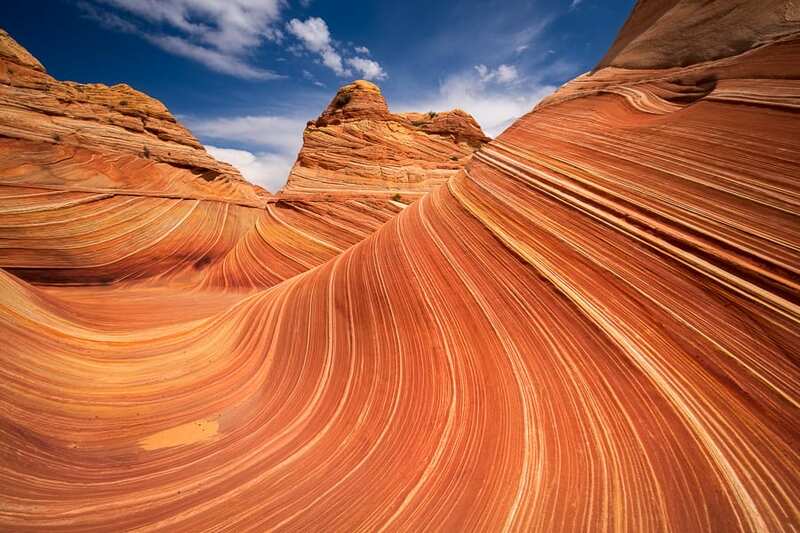 The Wave is an astounding location, but remember, it’s not the only thing at Coyote Buttes North. After you use these suggestions to win your permit, make sure you explore the surrounding area while you are out there because chances are you won’t be back. Also keep in mind that if you do not win, your visit to Southern Utah is not a wasted trip. There are plenty of fantastic places to see and you should see as many of them as you can while you’re here. Here at Action Photo Tours, our priority is to make sure that you get the most out of your trip to Southern Utah. Whether visiting the Wave or finding alternatives, our knowledgeable guides will be able to maximize your time at these beautiful locations. Sign up for a tour today and see the best sights Southern Utah has to offer! Enjoy your visit and good luck!